Each new year begins with rituals; waiting for the clock to strike midnight, reading lists proclaiming the best of this and the worst of that, reflecting on the year that just ended and making resolutions for the one ahead. As I thought about 2013 this week, I started to focus on things I should do more or less of; measurable actions that make it easy for me to determine whether I've succeeded. Based on the number of apps designed to track our every habit, this seems to be a common desire. While I was writing this dispatch, I heard from Marius, the wonderfully talented designer who is helping bring the Uncommon site to life. I had been updating our Basecamp project and he hadn't chimed in for a few days. Then, I found out why. 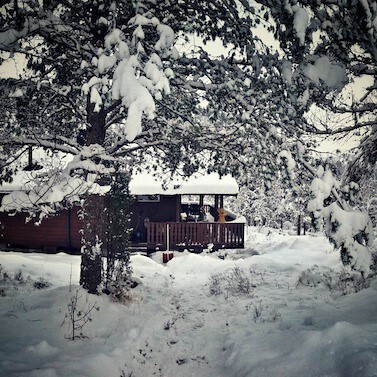 Accompanying his update was this beautiful photo of a snow-covered cabin in Norway. I realized at that moment that what I want out of a new year can't be measured. It isn't an achievement I want to unlock. It isn't something I want to do, it's simply a way I want to be; immutable priorities lived out slowly and peacefully in the company of quality people like you. Last week's dispatch asked, If you could wake up anywhere in the world on January 1, where would it be? Honestly, if asked in the past I might have said something far more exotic, like Henry Miller's Paris or in a cot swinging in the warm morning air of the Florida Keys, but after surviving another year on a planet where the death of innocents is a daily dirge, I just want to wake up the same way I did this morning, with my wife tucked beside me and my two little girls giggling in morning play across the hall. Wake me up on January 1, 2013 in College Station, Texas. I'd welcome the new year with coffee, eggnog, a deck of cards, and the strongest woman I know — my Mom. And between naps, Dad and I would spend some time with a ukelele singing oldies but goodies. The twinkle in their eyes alone is worth the trip. I have this vivid memory from my childhood, of Christmas and New Years spent in a secluded cabin in the Sierra Nevada Mountains, I had to be 7 or 8 years old. My parents were happy, and the fire was blazing. I remember going tubing down the mountainside with my brother and little sister. On one of these tubing expeditions, I slid into a tiny creek and soaked by boots and socks in the icy cold water. Seeing my distress, my father picked me up, placed me on the hood of the truck, took off my boots and wet socks, and massaged my feet back to life with his warm hands. This was one of the last vacations we took as a family, as financial crisis and other priorities took over. Now, I have a family of my own, and when I think about where I would want to be on January 1st, I guess the answer would be this... I want to be with my family, in a small cabin surrounded by mountains, with nothing to do but be carried away by the day's adventures. St. John. It's freezing in Little Rock as we wait for power to return after a record-breaking storm. This may be hokey, but Austin, Texas in my bed in my house with my incredible wife and our amazing toddler son, and our dumb, barmy dog (just the way we like him). I recently reconnected with some people that I haven't talked to in about a decade and I had a hard time keeping myself from just gushing about how awesome my life is these days. I would change so little it's not even worth the effort to enumerate. So often, moment-to-moment and day-to-day, I am exactly where I want to be doing what I want to be doing. So... more of the same, please! On a beach in the Caribbean. Eagle Pass, TX — my wife could see her sister and family, and nothing would make me happier. I would want to wake up anywhere so long as I could be surrounded by my husband, our children, their spouses, and our grandkids. In a suite at the Tierra Patagonia Hotel in Torres del Paine, Chile with my lovely wife. Summer and incredible views beckon from this enchanted land of the South. Sartre was famous for writing in the corner of Les Deux Magots – cafe privacy, where the white noise of conversation and cutlery damps down distracting input, fashioning a creative cocoon in the midst of the world. You could argue that we are only now achieving the ability to record everything, and that this will improve and enlighten our future selves, but I think that we would be losing something in such a world. If data is ubiquitous then it becomes valueless; perhaps some data needs to be ephemeral rather than recorded and made weighty with time. Handwriting can be untidy and malformed and difficult to read, but there is always going to be someone who recognizes even the worst of handwritings and treasures it because of who it comes from. It’s not about doing things in slow motion, but rather taking time for depth and storytelling. It’s about aiming for quality over quantity. It’s about taking time for reflection and creative restoration. What three things would you take with you to your cabin in the woods?